In the hustle and bustle that becomes December, we look for easy things to fix for we are going a thousand miles an hour in many directions. Roasted root vegetables are a perfect side dish in December. You toss the vegetables with olive oil, salt and pepper and put them in a 425 oven for about 25 minutes or until they're soft and caramelized. Our favorite is a mix of carrot, sweet potato, parsnip and butternut squash. It's a big platter for two but leftovers are good warmed over and whirled in a food processor and added to chicken broth with a little cream, it makes a great lunchtime soup. While they bake, you can finish wrapping those presents or addressing those Christmas cards or do one of the myriad of things that need to be done before Christmas. It has been a busy week at Linderhof -- not necessarily with chores for it's often fun things that we're involved in. But whether it's fun things or Christmas chores, easy meals are important mid December -- for our kitchen time is better spent making Christmas cookies and candy! It's Pink Saturday so please visit Beverly at How Sweet the Sound to see other Pink Saturday posts. Sounds wonderful, dear! Slow down a bit this week and enjoy the last weeks festivities! I'll be baking a batch of cookies and one pie here. Decorating a two~tier cake for our ladies circle meeting Tuesday. Then it's just waiting on Christmas, music and programs to enjoy! I love it when something is roasting in the oven. I love the whole concept of a root vegetable theme, Martha. Looks lovely too. These look delicious! Merry Christmas! This is my favorite way to prepare root vegetables and will serve this along side our Christmas roast. Happiest holiday best wishes to you and your family, Martha. 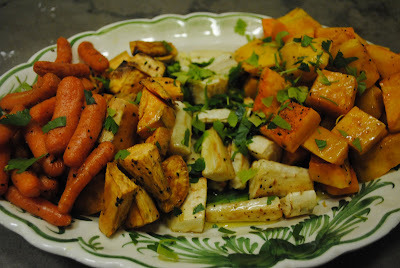 I think I'm addicted to roasted root vegetables - nothing is nicer as a side dish on a winter evening.